On days when the temperature is set to soar into the high 30s and then past 40, I get up early to enjoy the quiet over a cup of coffee, before the sun touches the garden and the battle against the elements resumes. The prospect of three or four days of blistering heat has become a regular fact of life for most of south-east Australia over the summer months. It’s made urban gardening a difficult prospect, as cities produce a particular kind of heat that is magnified by concrete, buildings, roads, cars, and a lack of natural shade. But you do what you can, right? 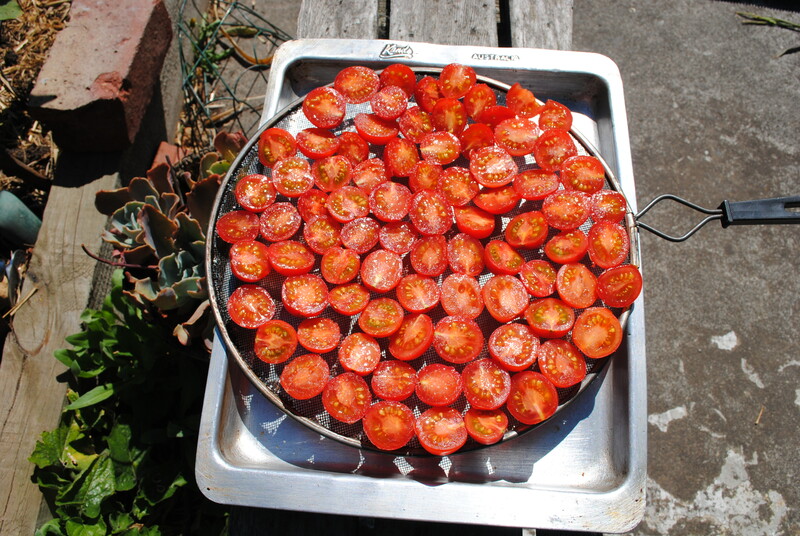 So I take advantage of the relentless heat to dry tomatoes the traditional way. My tomatoes are booming again this summer, with at least four kilos ripening every second day. Many of these are my favourite variety – the Principessa Borghese – which was bred by the Borgheses specifically for sun-dried tomatoes. And as hard as it is to imagine a time when I won’t have tomato plants dripping with fruit, I know that I need to preserve those little packages of deliciousness for the colder months. There’s sauce, of course (one batch completed last week), and chutney, and then there’s sun-dried tomatoes. I’d have to say the latter is my preference. We’ve still got some that I dried last year, which means they’ve performed their function perfectly, providing us with tomatoes right through the off-season. And a key to living ‘sustainably’ (much as I dislike that word) is eating seasonally. 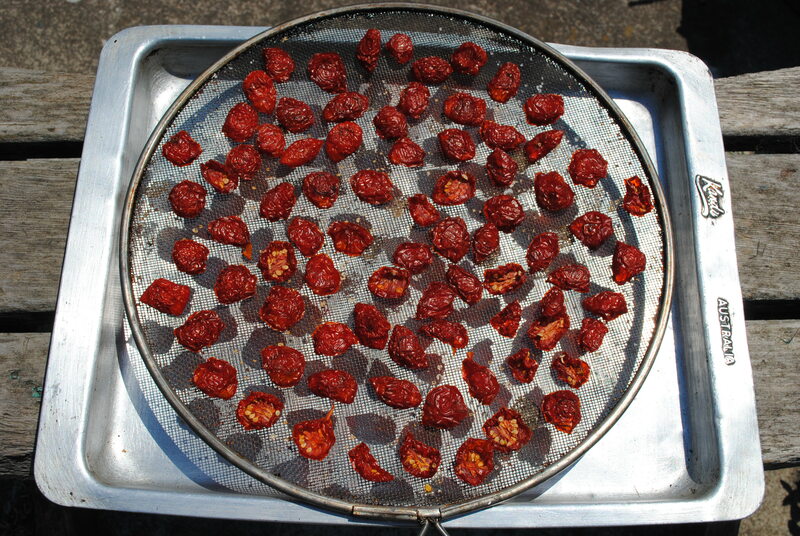 Sun-drying tomatoes is about the easiest and best method of preserving tomatoes going around. I dry them a batch at a time, as I don’t have a very big drying rack. This is aided by the fact that we seem to have a four day on/two or three day off cycle of heat at the moment. For next summer I plan to develop a larger rack, using a fly-wire window, to increase production. Day One: Slice the tomatoes in half and place them with insides up on a fine wire rack over a tray (this allows air to circulate underneath). Sprinkle the tomatoes with high quality sea salt and leave them in direct sunlight. I usually put them on a table or a bench and move them around throughout the day to maximise their sun exposure. Bring them in at night to avoid any condensation, which will slow the drying process. As mentioned above, I have a preference for Principessa Borghese, which is a small, slightly plum-shaped tomato and, true to its purpose, is unbelievably good when sun-dried. 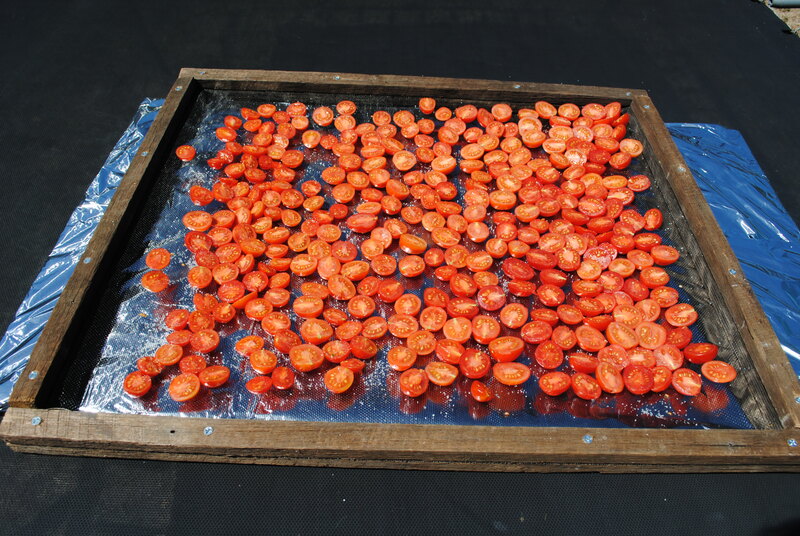 Obviously any tomato variety can be used but the larger the fruit, the longer the drying process will take. Day Two: Here are my babies at the end of two days in the sun, with the drying process well-established. The aim is to remove up to 90% of the moisture from the tomatoes. For semi-dried tomatoes, three days is probably enough, but you’ll need to store them in olive oil. Of course fully dried tomatoes can be stored this way as well, adding herbs, chillies and garlic to taste, but I like to store them in an airtight jar, adding them to oil throughout the year as required. Day Three/Four: By the end of four days of intense sun the tomatoes should be dry. I amalgamated days three and four because a wind picked up and I didn’t want to discover my now lightweight babies scattered across the garden. So they were out for half of Day Three and all of Day Four, which was a winner at 36 degrees with a blaring sun and a hot, dry breeze. I also turned them over across these two days to dry the undersides. You can test for dryness by eating one – they should be slightly crunchy and very chewy. And you’ll have the distinct pleasure of tasting something akin to … well, I actually don’t have words for it. Take a whiff of your tomatoes as they’re drying – that smell gets somewhere close to how amazing they will taste. I’ve just put another batch out to dry, as we’ve got a corker of a day tomorrow, with 40 predicted (no doubt it will get hotter than that), and then another few days in the mid to high 30s to follow. Difficult as these days will be to manage in terms of personal well-being – son Max has a cricket match tomorrow, which means I have four hours or so on the sidelines and then I’m DJ-ing a party with handy guy through a night that won’t go below 21 degrees – at least on one level I’m using the sun to my advantage. This is really all an urban gardener can do – adapt to our new extremes, gardening conservatively in some ways and inventively in others. The way I see it is, if we didn’t have these periodic heatwaves, I wouldn’t be able to dry my tomatoes. Postcript: Since publishing this post, we’ve made a bigger rack for drying tomatoes, using an off cut of fly-wire and some hardwood strips we had lying around. I’ve covered a board with aluminum foil to provide reflection from underneath and I can now sun-dry tomatoes in quantities that will last us through the off-season. 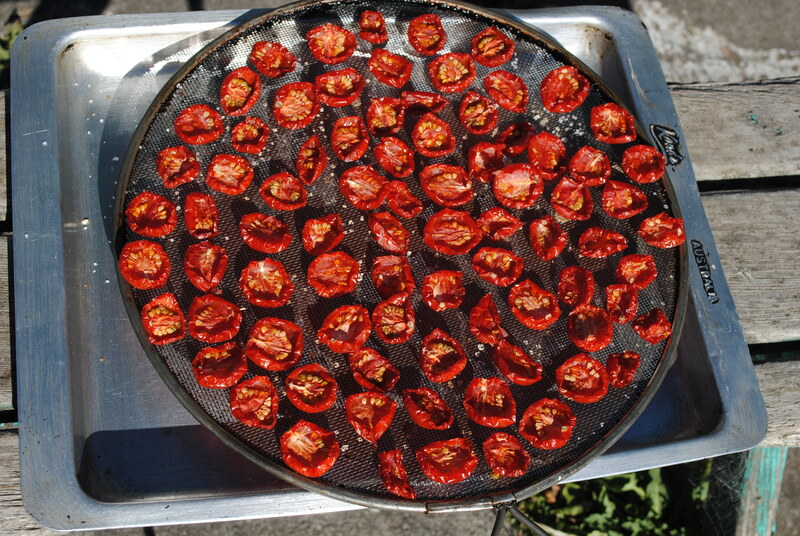 Being someone who likes a low salt diet, is it possible to dry the tomatoes without salting them? Do you know – or can you point me to somewhere that might have an idea? Absolutely no need to use salt. This just speeds up the drying and increases the taste, as far as I’m aware, so yes, drying without is no problem at all.